Home > News > Admissions > Why Should You Do An MBA In Hong Kong? MBA applicants are an increasingly jet-setting bunch. The Graduate Management Admission Council (GMAC) reported in 2017 that nearly 60% of prospective business school students intended to apply to programs based outside their country of residence, up from 44% in 2009. But when the world is your oyster, how do you choose which part of it to settle in for your MBA? For Kazuhiro Matsumoto—Kazu for short—there was only one answer: Hong Kong, at Hong Kong University of Science and Technology (HKUST) Business School. Kazu had been working for Yamaha in Iwata, Japan, before he moved abroad for his MBA. But what made him choose this city for his MBA program? “Of course I could learn business skills in Japan by entering Japanese universities,” Kazu responds, “however, I have a preference for international courses, and Hong Kong has a diverse international environment. Indeed, Kazu found that there were several stimulating contrasts between Hong Kong and his home country—beginning, naturally, with the languages that are spoken there. “In Hong Kong, of course, the local language is Cantonese,” he says. “But Hong Kong is very international, so more people can speak English. HKUST offers the opportunity for interested students to learn Mandarin while on the MBA, even allowing them to integrate their learning into cultural activities to give them a functional knowledge of an important business language. And, with the Immigration Arrangements for Non-local Graduates (IANG) visa, graduates of courses in Hong Kong have the option to extend their stay in the area for up to a year. But the globalized nature of Hong Kong as a city didn’t only have the benefit of getting Kazu outside of his linguistic comfort zone: he also got to meet and network with top investors in the banking sector. HKUST Business School is partnered with many massive corporations who frequently meet with students to network and impart advice, including big names like CitiBank and Goldman Sachs. 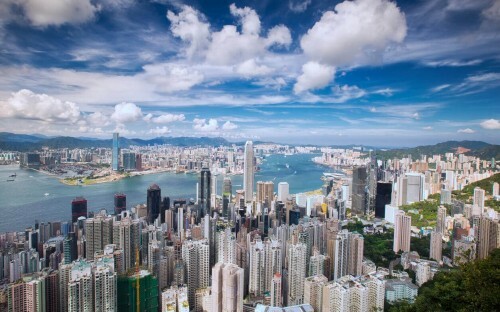 Even outside of the school’s own forays into finance, Hong Kong holds third position in the Global Financial Centers Index (GFCI) of finance hubs around the world, hot on the heels of New York and London. In fact, it’s only five points behind top dog New York, and beats its next closest rival, Singapore, by a staggering 14 points. This highlights Hong Kong as one of the key challengers to Western finance hubs in the near future, blowing many other financial centers, even within Asia, right out of the water. Plus, given the fact that it is also well-connected to its runners-up on the GFCI—Singapore, Tokyo, and Shanghai—it appears as an attractive proposition for global businesspeople looking to establish a career in the future of finance. But it’s not just its financial connections that made the school attractive to Kazu, it was also its kinship with the technology division at HKUST. Kazu got involved with the HKUST Hackathon which takes place each year, bringing together hundreds of participants from more than 15 universities. During the Hackathon, teams of students work together on solutions in various themed areas—for example, one of the themes during the 2018 Hackathon was Cybersecurity—and test their ideas using the Tianhe-2 supercomputer, installed at the National Super Computer Center in nearby Guangzhou. This organizational and technological experience has helped Kazu to move up in the chain of command at Yamaha since his graduation in 2017. So, from international exposure, to financial access, to technological expertise, Hong Kong has it all—and for Kazu, all of it can be found on the MBA at HKUST Business School.